1. Shut Down your Computer or Laptop. 3. Now we need to reset the Ipod (it will not erase anything on your Ipod, don't worry). To reset move the hold button (on top of the ipod) once to hold then back to original position. 4. Then press and hold the center button and the top menu button at the same time for 6 seconds. 5. Turn on your computer and it should automatically detect and install the ipod automatically. If you own a laptop with UEFI (normally Windows 8 pre-installed PC), you can natively install Ubuntu and Dual Boot ith your current Windows 8/8.1 by using the steps below. This tutorial is base on what I did with my Acer Aspire E 15 series. 1. Create a new disk space for ubuntu installation. You can do this by open Disk management and shrink volume to create a new unpartitioned space (Free Space). I recommend 30GB. Go to control panel - hardware and sound - power options, the select change what power button does on the left panel. Turn off the fast startup bu uncheck the box. 3. Restart with advance setting. Press restart and hold the shift button on your keyboard. Select troublshoot and advance option. Now select UEFI Firmware setting. To enter UEFI setting, press F2 upon boot - for model other than Acer the key might be DEL, ESC or F12. Now make the following changes. 1. It is a Wireless Connection means no wire or cable needed like fiber optic Internet or Streamyx packages. Just Plug and play. 2. Maximum Download Speed 1Mbps and Max upload speed is 384kbps. 3. Fixed IP adress means you can't use it outside your registered address. Example, If you are using it in Johor and want to move to Kedah, you are required to inform Yes Care at 018-333 0000 on the change of address. At the moment, this plan comes with unlimited data. However, Yes reserves the rights to cap the data quota at 30 GB with prior notice to subscribers. 5. No P2P, means no torrent and no voice call. 6. Contract 2 years. termination before the contract period end will be charges. 7. Registration fee RM150. 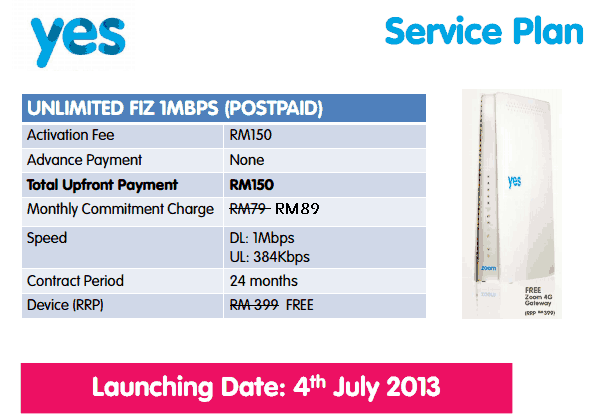 Monthly commitment is RM89. 8. WIFI Hotspot : Can connect up to 10 devices. You will get an SMS within 1-2 minutes from 66688 which will state your last payment and current outstanding balance you need to pay. If your astro service stopped and you want to reconnect you can also do this with SMS.